With Windows 10, Microsoft launched a new update strategy. No longer is a new operating system released every three to five years; rather, new functions are added to Windows twice a year. This installation, known as an in-place upgrade, replaces the existing Windows 10 version and involves a large amount of work for the admin. First, a clarification of terms: An in-place upgrade is the installation of a feature update. Previously known as Current Branch or Current Branch for Business, today the term Semi-Annual Channel is used. In-place upgrades are available for a wide variety of products. In most enterprise environments, they have not been the preferred choice for a migration approach. An in-place upgrade is basically the installation of a new version of Windows, while preserving existing applications and settings. In the corporate environment, the systems were previously reinstalled and configured for a new Windows version. Although this meant considerable effort, it also made it possible, as it were, to dispose of any contaminated sites with the new installation. Microsoft recommends giving clients direct access to the update servers for Windows on the Internet. Hardware-related components from third-party manufacturers often cause the biggest headaches, such as products for hard drive encryption or virus scanners. Because these components are closely linked to the operating system, optimizations to the security features of third-party Windows vendors, in particular, cause problems and prevent a smooth upgrade process. If your corporate clients can talk directly to Microsoft update servers during in-place upgrades, they can easily download the latest update information. These include compatibility information or updated drivers. In a fully managed environment, where clients do not have direct access to the update servers, a few steps may need to be taken to ensure a smooth update. These special requirements are usually available for download from Knowledge Base articles but must first be identified and then integrated into the OS to which the update is to be made. Additionally, Windows 10 retrieves feature packs from the update servers (e.g., language packages for text-to-speech or handwriting recognition). These packages must also be integrated for deployment in the enterprise. Administrators usually have the fewest possibilities in terms of active solutions for third-party components. Instead, they are dependent on the vendors, whose release notes should prove worthwhile. My recommendation is to use Microsoft internal products for virus scanners and hard drive encryption, at least in the medium term, which, as part of the operating system, should present the fewest problems with the new Windows 10 version. Another important aspect is the language used with the operating system, because the upgrade can only be carried out with one OS in an identical language if you want to keep all applications and settings. If an English operating system meets a computer whose system language is German during the upgrade, the upgrade cannot be performed. The recommended approach is therefore always to set the system language to English and then install the appropriate language packages for the users. Microsoft's in-house deployment tool is the System Center Configuration Manager (SCCM), for which you naturally also have the option of an in-place upgrade. 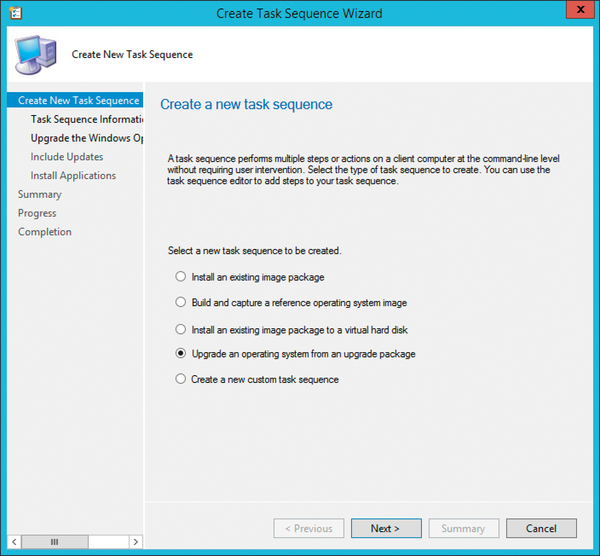 The SCCM offers two options for rolling out the updates. The servicing model, on the one hand, works in principle like Windows updates that perform upgrades. The administrator defines several rings that are assigned corresponding delay values. For example, ring 1 receives the Semi-Annual Channel immediately and ring 2 after 30 days; ring 3 receives the Long-Term servicing channel (formerly Current Branch for Business) and so on. Then, you assign individual computers to the rings (collections). The in-place upgrade is then performed as part of the Windows update. The approach behind this method is well thought out but in practice is unsuitable, because the in-place upgrade cannot be controlled in any way. For example, you cannot contribute language packs, drivers, or other elements. As a rule, this does not meet the requirements of non-English companies for such upgrade mechanisms. However, the servicing model can help to obtain a graphical overview of the version status of all Windows 10 clients. The alternative is the task sequence, in which you can define all steps for the in-place upgrade (Figure 1). By means of a task sequence, the upgrade procedure can be adapted to your own requirements; logfiles are no problem, either. As with the servicing model, you should create multiple deployment rings and roll out Windows 10 step by step. In practice, the rings or collections have become established, as shown in Table 1. Parallel to ring 6, ring 1 starts again with the next version of Windows 10, so the environment is constantly moving, and the Windows 10 project is never finished, but a continuous process. Figure 1: Upgrade processes can be controlled sensibly with a task sequence and the corresponding wizard. The Cluster-Aware Updating service gracefully handles OS and application updates within your cluster. We show you how to set up and manage this tool.